1. Perceived inventory “loss” happens to just about everybody sooner or later. 2. The inventory is rarely “gone for good” — it remains on LL’s servers even tho it may temporarily not show up in the viewer inventory list. 3. It takes TIME and EFFORT to get inventory to show up: “I looked and did not see it.” is not a thorough search. 1. INVENTORY IS NOT STORED ON YOUR VIEWER OR COMPUTER. 2. YOUR VIEWER HAS LINKS TO YOUR INVENTORY STORED ON LINDEN LAB SERVERS. It shows a list of items, not the items. 3. Sometimes the LINKS do not show in your viewer but the objects are STILL ON LL SERVERS. It is very rare for something to actually disappear from Linden Lab’s servers, but very common for your list not to show everything. YOUR INVENTORY IS NOT STORED IN YOUR VIEWER OR COMPUTER BUT ON LL SERVERS! As you can see from the diagram, just because something is missing from your inventory list does not mean it has been deleted from Linden Lab’s servers — if you erase something from your grocery list, that doesn’t remove anything from the grocery store’s shelves. IS YOUR ROUTER RUINING YOUR SECOND LIFE? This is pretty basic, but I have found that some people are not aware that there is a search field (box) at the top of the inventory window. They just rummage around their inventories looking for things — which might work if your inventory is very small. You can use the filters in the top of your inventory menu to narrow down by what kind of item it is and how long ago you took it into inventory. For example, if you are looking for an object you bought within the last month, your filter can show you ONLY those items. TIP: If you don’t have any idea of the name of the item but you know who the creator is, you can go up to the menu and choose to search by creator’s name instead of the item name. Use Inventory filters from Torley on Vimeo. Using Firestorm? CLICK HERE to go to the FIRESTORM SUPPORT PAGE FOR RECOVERING INVENTORY OR INWORLD MISSING ITEMS. Shila Szondi of Simply Shila’s sent this message out to her group. “Lost Inventory? I have lost a ton of stuff recently and it is because the object folder was full, as I have been deleting items from there, missing items are returning. If you also are losing things, move stuff out of the objects folder to other folders, clear cache, and relog. Sweet Valentine suggests that if you quickly want to reduce your objects folder size without taking time to sort through it, just make several objects folders. When a group of things are returned to you or deleted, they go to your inventory in a clump, which makes finding your stuff in the clump a challenge (and btw, stuff is only returned to the owner, never the creator). The clump looks like a cube broken in pieces, as shown in the video below. It is called a COALESCED OBJECT. Returned items go to the Lost and Found folder; deleted items go to Trash. Unless you empty the trash, it will sit there forever. Don’t rez coalesced objects close to no-build parcels from Torley on Vimeo. “The single biggest inventory related issue we find from our users is a poor internet connection combined with a lack of patience and frustrated futile attempts to “fix” the issue by clearing the cache, reinstalling … and worse. If you have inventory woes, check your connection. Reboot your PC and your router .. leave it off for a few minutes. Use a wired connection rather than wifi … if you must use wifi, move some place else or adjust your antenna. Close your web browser and don’t minimize SL while you wait. Be patient. Find and landmark a nice quiet water sim (like KARA) and log in there when you have issues you can’t resolve yourself. 1) First, of course, clear cache in your viewer Preferences, usually in the network tab. Log out for 5 MINUTES. Log back in and go get a cup of coffee while your inventory slowly loads. If it stalls, type “a” in search, then if it stalls again, “e”. Sometimes this actually works! If you have switched between viewers, that can cause particular inventory cache problems. In any case, whatever the reason, if clicking the Clear Cache button in your preference does not work, then try going into your computer and manually deleting the cache folder entirely, which forced it to build a new list. 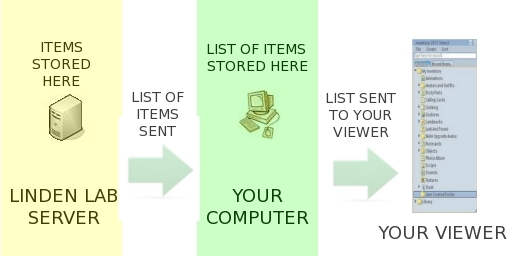 Sharing the cache folder between multiple viewers is a primary cause of “inventory loss” which many experience, although not the only cause. It also frequently results in crashes or erratic behavior. Clearing your cache manually will “cure” all manner of odd behavior and is the suggested procedure before resorting to more drastic steps like reinstalling the viewer. 2. Go to the first path “Cache Location” and click the “Open” button behind the path. This will open a file explorer window displaying your current cache location. 3. Logout (close the viewer) and then delete everything inside the cache folder displayed in your file explorer. 1.Log back into SL, to a quiet region (try Smith or Pooley). On your inventory window, click “Recent Items”. 2.Wait for your inventory to repopulate fully. The process may be sped up, if necessary, by typing random letters into the search bar. 4.Watch as it repopulates. As long as you can see (Fetched…) at the top of the inventory window, it is still loading. 5.Once inventory has repopulated, log out of SL once more, then log back in. That process works in a very high percentage of times. If it does not work for you, then I suggest filing a support ticket that details what you have already tried and asks LL for their help. a) Clear cache, log out, then open your viewer. b) Control &gt; Shift &gt; G to get a grid list. Choose Secondlifebeta or Aditi. c) Log in. Do nothing while inventory loads. d) If loading stops, type “a” to make it load more. Then “e”. e) Then log into the main Secondlife grid (or Agni), and type Pooley or Sandra in the region field (a near emtpy sim). Go to the “Develop” menu and check the status of “Use HTTP Inventory.” Normally this is the fastest and most reliable way of getting your inventory, make sure it’s selected. However, if it is and you’re still having problems see if turning it off can help. Some routers have issues with the way SL uses its HTTP connections. 1) This doesn’t really help the problem but, you can contact support and just ask them if they can see Your Thingy in your inventory, even if you cannot. I have done this before when I thought I had lost something valuable, and it was a relief that at least the Linden could see it there even if I could not. 2) I have only had to do this once, and it is sort of a deep dark secret, but the Lindens (and maybe other support persons) can go into your inventory and do something or other to fix it and make things show up. File a ticket or contact live chat and ask for them to reinitialize it. Be persistant. They don’t want to do this. 2. Type in one word in the name of the object (or copy and paste the entire name). 3. Click Teleport to It. If you think something may be under a floor or in a wall, you can go into your Advanced menu to Rendering and choose Wiremode. Then you will be able to see through everything — you may find all kinds of things! The Mini-Map can be a useful tool to help you locate objects inworld. To activate the Mini-Map, click the Mini-Map button at the bottom of the screen. Can I resize the Mini-Map? Yes. Click and drag the mouse at the bottom-right corner to the Mini-Map window. Can I zoom in on the Mini-Map? Yes. Right-click the Mini-Map window and choose Zoom Close. The Mini-Map’s default is Zoom Medium. You can also use your mouse wheel to control zoom on the Mini-Map. The Tools menu has a useful option that allows you to select only objects that are owned by you. This can help locate all your objects in the immediate area; they may be hidden by other Resident’s objects. Now that the Edit tool is activated, click-and-drag your mouse to make a selection. The only objects to highlight will be yours, possibly revealing the object you were unable to see before. Objects may be lost underground as the result of an editing mistake or by changes in the terrain. The following steps provide instructions to help locate objects that may be stuck underground. First, hide the ground in Second Life: Activate the advanced menu on the menu bar by pressing Ctrl–Alt–⇧ Shift–D. Then, choose Advanced &gt; Rendering &gt; Type &gt; Surface Patch. Hold down the Alt key and press Page Up (PgUp) or Page Down (PgDn). This allows you to rotate your camera, locating any of your objects that may be buried underground. It may be impossible to see some objects if they are invisible. The Highlight Transparent feature allows you to view invisible objects. Transparent objects will turn translucent red once this feature has been enabled. Often, object you are looking for may contain a script. Beacons make it easy to locate any objects that contain a script. If the beacons don’t appear to be working, make sure the Render Beacons option is enabled. This draws crosshairs over any beacons, making them easier to locate. There is also a problem from having too many things in the ‘root’ inventory folder, named My Inventory. This is the folder you see when you select the sidebar’s Suitcase and then Additional Options, Close All Folders. When you buy things that give you a folder, this is the folder in which they are often placed. When you open things, this is often the folder to which they go. If you do not organize your inventory, there can be lots of things in it. At some point it is too many and contributes to inventory problems. Having a massive number of things in the Objects folder can also cause problems. I suspect have a massive number of things in any folder can cause problems. The fix is easy. Create a folder, let’s say, in My Inventory folder and name it Clothes. Move all your clothing items from My Inventory folder into the new Clothes folder. Repeat this making folders and moving things into them until all that is left are the basic SL folders and the new ones you have made. How to manage your inventory from Torley on Vimeo.